Bullying has long been tolerated as a rite of passage among children and adolescents. There is an implication that individuals who are bullied must have “asked for” this type of treatment or deserved it. Sometimes, even the child who is bullied begins to internalize this idea. For many years, there has been a general acceptance and collective shrug when it comes to a child or an adolescent with greater social capital or power pushing around a child perceived as subordinate. But bullying is not developmentally appropriate; it should not be considered a normal part of the typical social grouping that occurs throughout a child’s life. Although bullying behavior endures through generations, the environment is changing. Historically, bullying has occurred at school, the physical setting in which most of childhood is centered and the primary source for peer group formation. In recent years, however, the physical setting is not the only place bullying occurs. Technology allows for an entirely new type of digital electronic aggression—cyberbullying—which takes place through chat rooms, instant messaging, social media, and other forms of digital electronic communication. 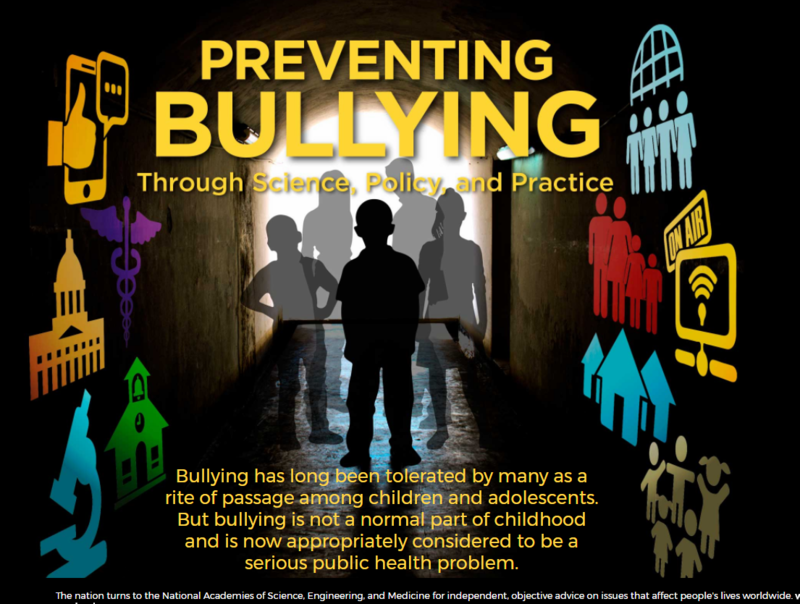 Although the public health community recognizes that bullying is a problem, it has been difficult for researchers to determine the extent of bullying in the United States. The prevalence data available indicate that school-based bullying likely affects between 18-31 percent of children and youths, and the prevalence of cyber victimization ranges from 7 percent to 15 percent of youths. 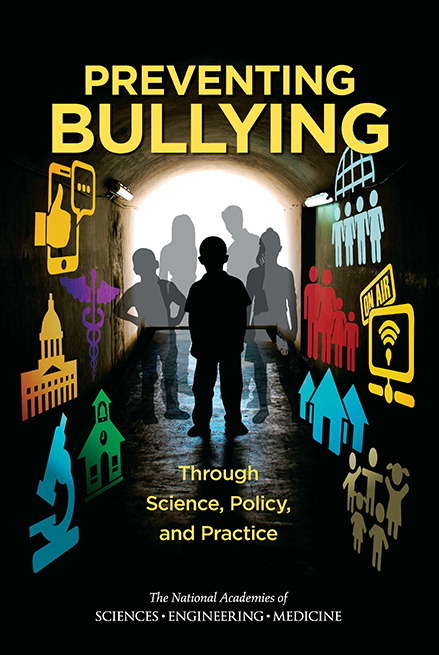 Composition of peer groups, shifting demographics, changing societal norms, and modern technology are contextual factors that must be considered to understand and effectively react to bullying in the United States. Youths are embedded in multiple contexts and each of these contexts interacts with individual characteristics in ways that either exacerbate or attenuate the association between these individual characteristics and bullying perpetration or victimization. 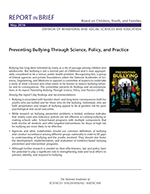 Preventing Bullying Through Science, Policy, and Practice evaluates the state of the science on biological and psychosocial consequences of bullying as well as the context, scope, and impact of the problem. The report also outlines next steps in prevention for policymakers, parents, educators, healthcare providers, and others concerned with the care of children. Sponsors: Centers for Disease Control and Prevention, Eunice Kennedy Shriver National Institute of Child Health and Human Development, Health Resources and Services Administration of the U.S. Department of Health and Human Services, Highmark Foundation, National Institute of Justice of the U.S. Department of Justice, Robert Wood Johnson Foundation, Semi J. and Ruth W. Begun Foundation, and Substance Abuse and Mental Health Services Administration of the U.S. Department of Health and Human Services. 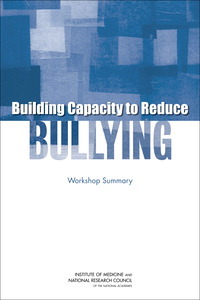 Building Capacity to Reduce Bullying: Workshop Summary is the summary of a 2014 workshop that brought together representatives of key sectors involved in bullying prevention to identify the conceptual models and interventions that have proven effective in decreasing bullying, to examine models that could increase protective factors and mitigate the negative effects of bullying, and to explore the appropriate roles of different groups in preventing bullying. 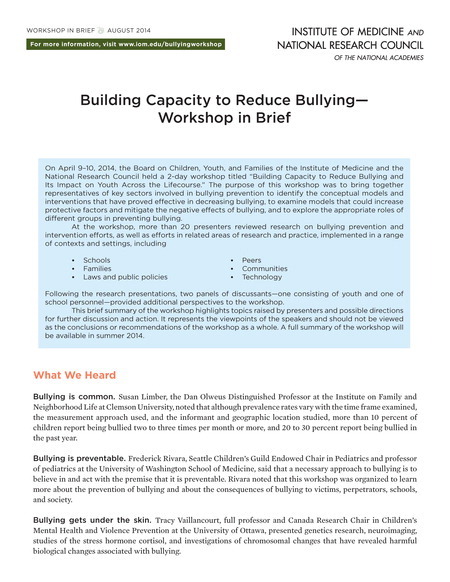 Building Capacity to Reduce Bullying: Workshop in Brief summarizes the presentation and discussions of the workshop held in 2014.